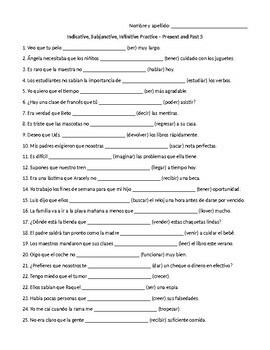 This is a 4 page set (very similar to "Indicative, Subjunctive, Infinitive Practice - Present and Past", published previously) with all kinds of practice with the subjunctive vs. the indicative. 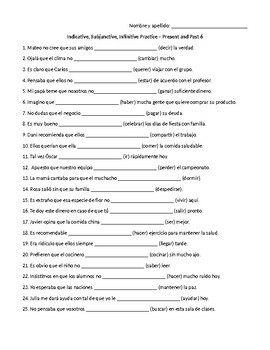 Each of the four pages has 25 fill-in-the-blank sentences (100 sentences total). 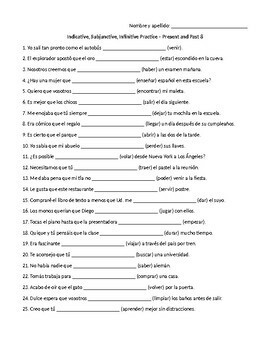 These practice sheets are meant for the most advanced high school Spanish students who are familiar with using infinitives along with present indicative, imperfect, preterite, present subjunctive, and imperfect subjunctive verbs. Please note that I am a former high school Spanish teacher but that I am not a native Spanish speaker! Let me know if you see something you want changed or if you disagree with my answer key. 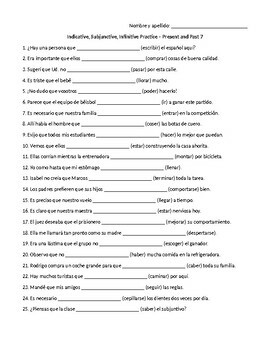 I'm selling this as a Microsoft Word file instead of a PDF so that you can add your own instructions, edit sentences to personalize the exercise for your class, etc.